I don’t usually endorse in game stores for MMO’s, especially if I purchased the game for $40 or more, and am currently paying them $15 a month for the right to play the game I payed them $40 or more for. That being said the entire industry is going that way, so I might as well start working at steering it in the direction I want it to go. With that in mind I had an idea while I was laying in bed this morning. It was partly because I read a bunch of Star Trek Online related blogs last night before going to bed, and partly because I’m still trying to get through The Original Series. So what is this amazing idea you ask? It’s simple, as anything going into the store should be. They have tons of different “bridges” in the game and for sale in the store, but do they have the most important bridge in Star Trek history? No they do not. What is this bridge you ask? The destroyed bridge bridge. I want bodies strewn everywhere, lights flashing, NPC’s using medical tricorders on my Bridge Officers. I want the ship the shake every few minutes and send people flying, only to land on the floor and have medics come running up to them and check on them. I want debris and rubble to be strewn around the bridge! Just a small idea I had, what do you think? That’s right, Amuntoth is now Commander 2. I only had about an hour to play last night after classes but I managed to get in a really fun mission. It was a raid on a Romulan planet that started with my team infiltrating, taking out some space resistance, transporting to the surface to rescure some Starfleet officers, one of whom you will see at some point on here. 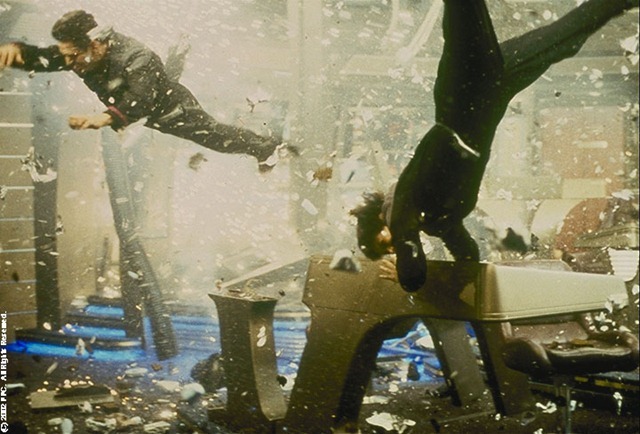 We then had to destroy some weapons they were making, then transport back to the ship and join over 15 NPC Starfleet ships against the same number of NPC Romulan ships. Overall I had a blast with the episode and it reminded me why I am playing Star Trek Online at the moment. I’ve also started playing World of Warcraft again with my wife (probably going to switch between this and LOTRO, which is what we tend to do). I usually have one MMO I’m subbed to with my wife, usually WoW or LOTRO, and then one for myself, which at the moment is STO. You won’t hear much WoW related from me on here, unless it is in relation to another topic, as that is pretty much covered in other blogs and I’d hate to run my readers away. 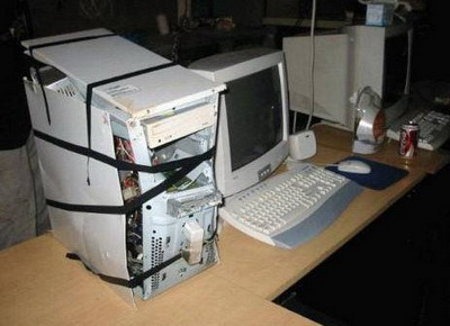 Sadly though her computer is having some serious issues and may not be around much longer. I’ve done most of what I could and it MAY or MAY NOT be fixed, depending on the whims of whatever spiteful deity that has decided to house itself in our computers and cause all kinds of problems. In the past three years I have had two different computers ignite in flames, both in different houses with different power cords and different everything. Hopefully that’s not going to happen this time. We’ve done all the usual and it appears it might be here graphics card. I currently have hers in my computer and mine in hers. I’m hoping that it’s just some weird conflict with her other hardware, but I’m pretty doubtful. I expect the dang thing to die any minute now so if you don’t hear from me for a day or two and then I upload a huge rant, that’s probably what it is. 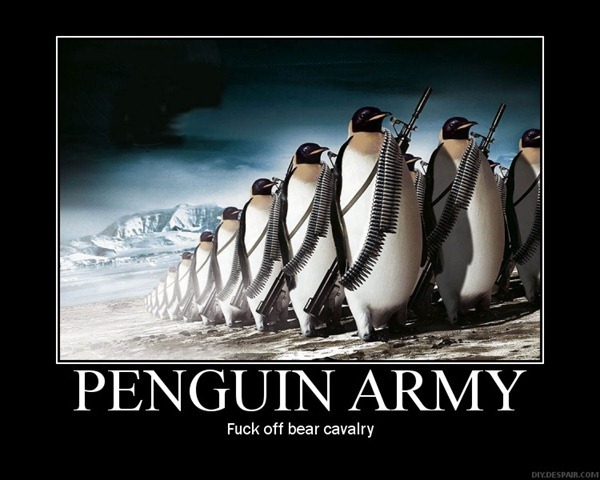 That or the penguins HAVE risen up and started their invasion of human occupied lands. In that case may God have mercy on our souls, and our computers. I decided to make myself a wallpaper and ended up making several, so I thought I’d share them with you all. I hope you enjoy! 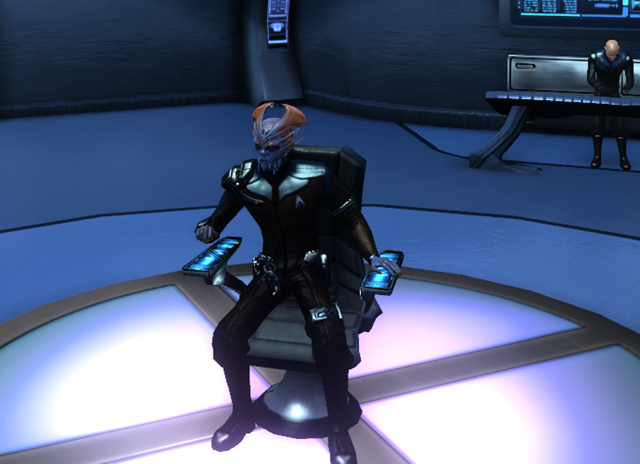 That’s right, Amuntoth D’Teklik is now Commander 1! Also I managed to snag some Original Series uniforms and now my entire crew is sporting them. You can expect a new Captain’s Log update this weekend with some amazing turns of events, in my opinion in any case. I did want to touch on some interesting Episodes I went on today in my attempt to make it to Commander. First I just want to say that I had to try the mission three times before it would complete. There seems to be a bug in it and I will warn you now, if you beam down to the station and start moving, and the NPC that is with you just stands there, you should beam back up and restart that part of the mission. Aside from the technical difficulties associated with the episode I really enjoyed it. Sure it wasn’t completely unexpected but I had a lot of fun. Because it was borked, my first really borked episode since launch, I went to the forums to see if it was a common thing and yes, yes it is. I also discovered that it is a mission of some controversy. Many people seem to feel that they should be able to do something different than what the game forces you to do. They know what’s coming and they want to avoid it because their character would never do what he does. I’m sorry I’m being vague here but I don’t want to spoil it for anyone. The problem I have with this is the same problem I have with all these types of arguments. Just because YOU know something does not mean your character knows something. Just because YOU know the super item is in the desert dungeon because you looked it up doesn’t mean your character has any reason to go to the desert, let alone to go grave robbing in the desert. “But Amun! It’s so painfully obvious what is about to happen my character should know!” You might be saying and yes, to you, sitting back in your house playing a calming video game, it might be painfully obvious. To your captain however, a man who has lost dozens of people he knew, some he possibly cared for in a multi-front war with former allies, Borg, Romulans, Klingons, shape-shifters and more, a man who went from having no authority to being responsible for the lives of hundreds of people in the span of a day, a man who has been shot and stabbed multiple times in the short time he’s been captain, well a man like that might have a lot on his mind. The basic premise here is that a large Crystaline Entity is floating around the galaxy and being a danger to planets. It is your job, along with however many other random people that show up, to destroy this entity. As you attack it it will release dozens of crystal fragments that home in on ships and try to collide with them. If they do they explode and can destroy a ship quickly. If a fragment is destroyed, either by colliding with a player, a mine, or by being attacked, it heals the Entity for a drastic amount of HP. I fought this Entity on four separate occasions and I never saw it’s health drop below 98%. Sure the mission premise is interesting but let’s be honest with ourselves here: This mission requires you to have enough people, to avoid incoming mobs or CC them without hurting them, and to DPS the big guy down while you are doing this. This requires the same amount of coordination required of a guild for a raid, but without any of the benefits such as KNOWING AHEAD OF TIME YOU ARE GOING TO BE IN A RAID. So as I said we could never even hurt the thing. One time, no matter what was said in zone, local or in private messages, one player simply flew around shooting fragments and not responding to anything else. This kept the Entity’s health at 100%. The other times we just could not get coordinated. Someone would always get hit by the fragments resetting the boss to 100%. 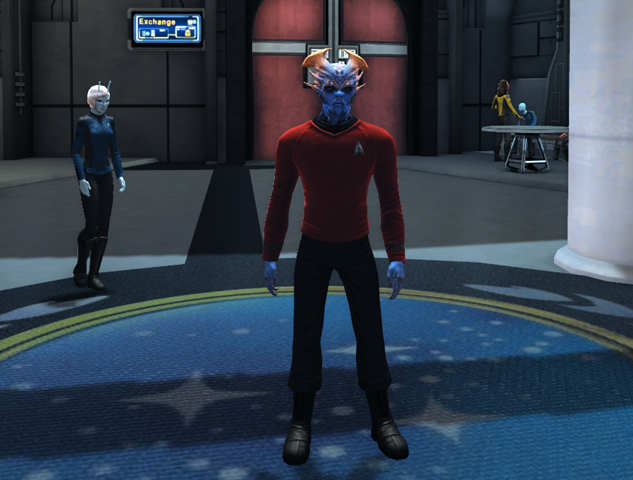 Overall I’m having a blast in STO and I’ll be playing for some time still. My name is Captain Amuntoth of Clan Teklik, Ensign in the Federation. I’ve been ordered to return to Earth Spacedock 1 as quickly as my warp engines can get me there. I’ve just had one quick stop to make on the way. I have been known to post a few stories based on my game characters. It’s really gun and if I keep up on it really makes me enjoy the game more. Not only that but I hope at least a few people out there receive some kind of enjoyment through reading them. First up we have Captain Nezi over at Warp Core Breach. Adventure Historian, as the writer and Fleetmate calls himself, is a wonderful writer. In the first episode he has crafted so many interesting and compelling characters that I can’t wait to come back for more! But Star Trek Online, and indeed fantasy MMOs, aren’t the only stories I read. My tastes in almost everything are what you might call…eclectic. This next story is a Sims 2 Legacy done by the ever amazing Yams over at her Livejournal. The Breckenridge legacy is not her first (her last one ended with the death of her old computer) but it is the current family. It’s still on the first generation but I am loving the characters, especially one named Galen who you can’t help but enjoy. I’m looking forward to more updates to both of these stories in the coming days and you should be too. Go check them out and you’ll see why I don’t want it to ever stop.